Tuesday, time for a new blog! A very busy week, but that’s nothing new and also something that won’t change the coming months. Let’s go straight to poker. After last Tuesday’s session I was in the green for the month again. I just want to log as many hours whenever I can, so on Wednesday I played a small session after going to the gym. I played 1.407 hands and won +$97,50. I just wanted to think about my game for a bit so I only played $3/$6 and played 14 tables at the same time. This was a great help, I can’t even describe what I’ve learned. I think 2,5 years ago I thought I was good enough to go semi-pro. A year later I learned so much and was really good enough to go semi-pro, at least that was what I thought. Another 6 months later after my October 2008 Las Vegas trip I really saw the light, there is no way I can explain to people what the difference is, but after I came back from my trip, I just knew I was good enough. I played maybe 40 hours of live poker in Las Vegas at the $15/$30 Limit tables during that trip, but because I had so much time because live play is so slow, I could think about every decision and I spotted some things that really helped my game a lot. It’s to0 long ago to remember exactly what it was, but one thing I remember is that I learned to play 2nd pair a lot more aggressive then I used to do. Probably there were some other things, but that’s something that sticks out. The remaining of October, November and December were great months and in December I decided to really go semi-pro starting the 1st of January 2009. Back to last Wednesday. Last Year you could categorize 99% of the players in two categories. 1) Regulars 2) Fish. Most regulars play a same sort of style and every fish plays different but it’s not that hard to figure out how to get their money. Now there was a really small group, which played a different “winning” style of poker. 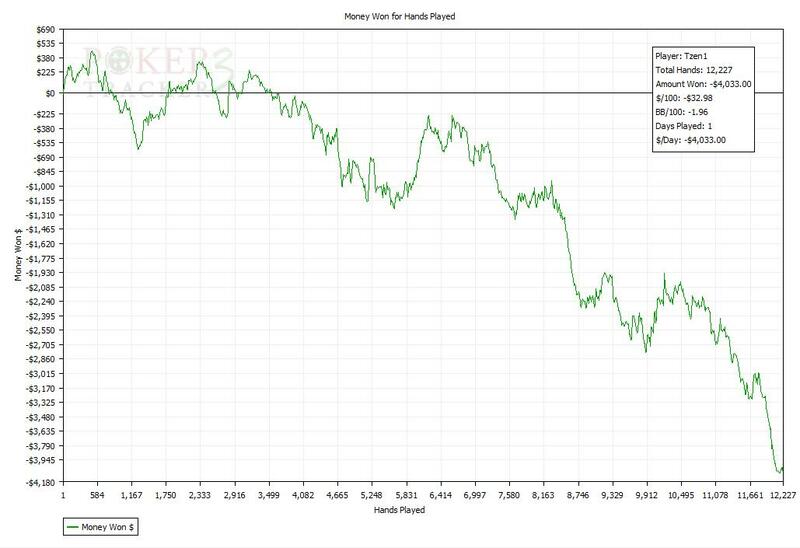 The most important difference was their unpredictability and the fact that they were playing more hands (higher VPIP) and played more aggressive then the average winning player. They probably play ABC poker (like most regs) vs the fish and play different against the regulars, so they can maximize their profit. I think there was only 1 regular who I saw a lot who played this style and some other players dropped by occasionally. I hated these players as it was really hard to play against them, I tried to avoid sitting close to them at the tables, but didn’t really have a counter strategy against these players. I was happy most of these players seemed to play 6Max or just didn’t play that many hands, also most didn’t play to much tables (maybe 8-12) at the same time. Now this year, I saw a lot more of these players, also because I play more $10/$20 and $15/$30. I wasn’t really sure how to play against these players. Sometimes I did really good, other times I felt like I was really a noob compared to them. I considered trying to play like these people as it seems to be a very good strategy (winrate is good), but it’s really far away from my current style and I also think it’s impossible to play 20-24 tables, as it requires a lot more thinking. Wednesday I saw the light, maybe I’m not there yet, but I finally can understand how these people play, how these people win and because I can now understand their strategy myself, I can counter it. I really had the feeling during my last sessions that I did a lot better against these players. I think playing some 6Max would really help me in improving against these players but I never really needed it. I did fine on the FR tables, so didn’t care that much, there was plenty of other things to focus on. I think I’ve made a big step in poker again and it’s crazy that after so many hands, there is still so much to learn. It’s funny if you meet people and you tell them you play poker. Some tell you that they think that they are really good, but just don’t have the time. They played 50 times with friends and family and won about 15 times. It’s impossible to explain things like sample size and variance to these people and they often really think they are good players. If you think about how much those people still need to learn, it’s impossible to explain it to other people. Sure there are some people who can learn these things in a couple of months, but most need years. I feel I’m not a really talented poker player, my key success factors are discipline and the ability to concentrate during longer periods. I might be a small winner in the games and learn slow, but I do learn and I never have huge losses due to tilt or bad bankroll management. I’m not sure if I really got the “key” now, a good sample size during the coming weeks will need to prove this. I do know for sure that I again have reached another level, it might not be that huge but it feels really good to still learn in this game and get better at it, maybe not every time, but at least once in a while. A small disclaimer already 🙂 I do understand that if I would always play 10-12 tables, I would learn a lot more and might improve my winrate a lot faster. That’s a choice I’ve made and I think that could be a nice topic for another blog. One big factor that plays a role in that choice is that I’m currently not willing/ready to play games higher then $15/$30 (due to the monetary swings) and I have the feeling I can currently beat those games. I’m already really happy I can beat the mid-stakes while still playing 20 tables. If I ever want to really play high stakes (or nosebleeds for that matter), I will have to drop down the number of tables and have still an awfull lot to learn, I do realise that! It’s Friday and I’m at work and I’m thinking what to do during the evening. Since I’m not planning to go out and weekends are the best days to play, I planned a nice and long poker session. The sessions starts pretty normal, up & down but the swings were not that bad the first 4.000 hands. At that moment I don’t hit a single hand and I’m down about $1.200, just variance. I win most money back right after and I’m almost back to break-even and again I see beats everywhere. I think I didn’t play bad at all during the 1st session. I played 7.939 hands, lost $1.165 but you can’t always win. I was unhappy with the fact that I was almost back to break-even and lost again so took a break and started an hour later again at 02:30. Yeah I learned a lot, but I don’t know what happened next. Something that really sticks out is my WTSD at $15/$30, 46.67% where normally this is somewhere between 35-37%. This is either due to a lot of bad luck (just having the 2nd best hand all the time) or I was feeling paranoid and called down every single hand where I had Ace high or higher. It wasn’t just the $15/$30 where I lost a shitload, also at $10/$20 I was running really awfull. At $5/$10 it looks pretty bad as well, but not as bad as the higher limits. The first 2.500 hands of the session I wasn’t playing bad at all, I just think I can blame most to variance. Possibly I was playing against a lot of good players, but I haven’t really checked that to be honest (I come back to that later). Did I surprise you? Still got that positive vibe? Well, I did! All I need to forget a session like that is one good night sleep. If you would talk to me right after that session, I would have probably lynched you at the spot 🙂 Losing motivates me, motivates me a lot. If I lose, it means I need to learn, I need to improve myself and that’s exactly what I like. I like the challenge, I need the challenge. Losing $4.00 means I need to win it back, that’s a challenge, in this case I think I made mistakes, which means I need to improve. With my new knowledge which I gained on Wednesday and with even more motivation then at the start of the year I started a small session before going out on Saturday. The result: 2.904 hands, +$215. After a nice night out I wake up at 11:30. Trust me, this never happens but it did. Debating my options I choose to go to the gym and cycle for 90minutes, not a bad start. After doing all sorts of stuff I sit down at 18:11 and after 40minutes I realize that I didn’t get a full bottle of water out my fridge. I take a break roughly every 2,5 hours, so that shouldn’t be a big problem. What I didn’t know at that moment, was that for the next 7 hours I was in the zone! For 7 straight hours I didn’t drink, eat or get off my chair! The first 6.700 hands it felt like I didn’t lose a single showdown. I was up $2.300 and feeling on top of the world. The next 2.000 hands almost made me puke. 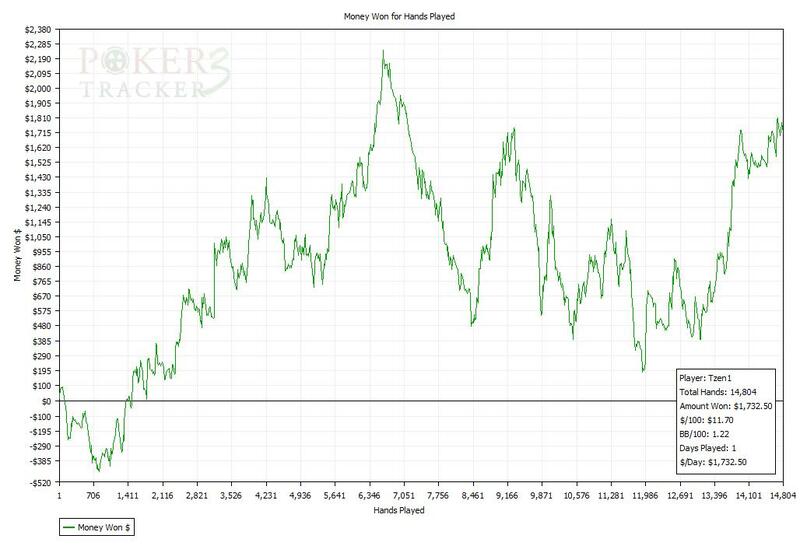 Trust me, this was plain simple variance but I lost $1.900 and was so pissed at the pokergods but still completely in “the zone”. I run it back up to +$1.688 in 9.255 hands total and was extremely pleased with my poker skills. It was time to take a break, since I finished Entourage (really good, go watch it if you didn’t yet) I started with a new TV series, The Wire. The first episodes are a bit slow (just like the start of Dexter), I’m not sure what to think of it yet, but looking at the rating at IMDB (9.7) it should be brilliant so I’m definitely going to watch the first season and go from there. Time for the 2nd session on Sunday. Still happy, this time with a full bottle of water I’m totally ready for total ownage. I think after reading a couple of blogs, you can already expect what happens, swings! I guess this will continue to be the red line in all my blogs during the coming year and it’s inherent to playing Limit but again I lost a shitload of money. 2.600 hands into the 2nd session -$1.550. That means I was only up $138 for the day, after being up $2.300 not acceptable! Pedal to the metal and my hands where bleeding since I was squeezing my mouse so hard! It paid off! After being down that -$1.550 I run it back up till +$44,50. 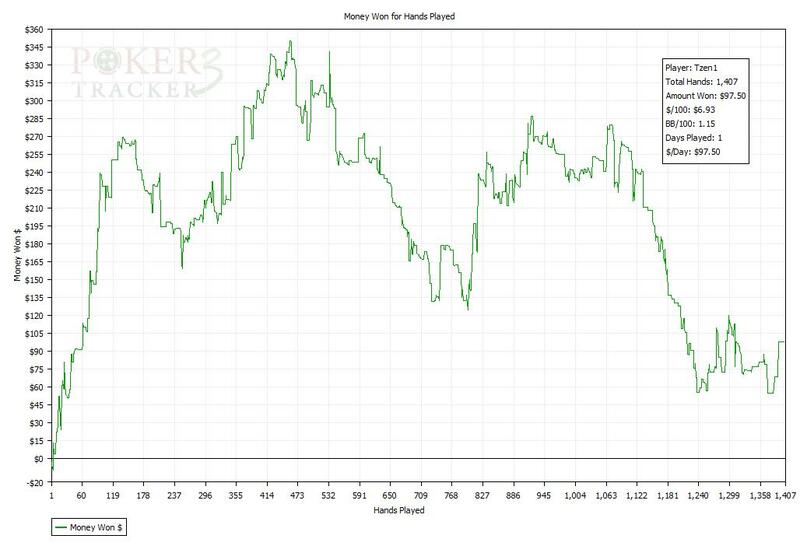 In that 2nd session I had a better winrate (1.25BB/100) then I had during the first session (1.21BB/100) which means I was running bad at the higher limits and really good at the lower limits. That indicates to me that I was not playing bad at all during that session, I was just unlucky at the higher limits and that happens! Final result: +1.732,50 after 14.804 hands (shitload of VPP). Monday was a start just like any other day. After 1,5 hours I’m down $2.300, plain simple variance! 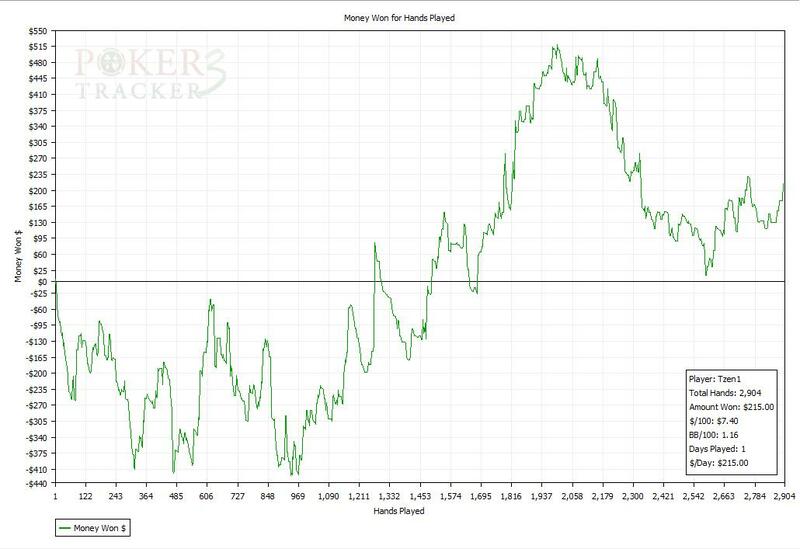 But wow… I was finally running normal and after 4.497 hands I was only down $1.141,50. After watching another episode of The Wire the start of the 2nd session was pretty awful as well. Down about $800 but not really worried, I had the feeling there was still money to get at the tables. Some very bad players joined the $10/$20 and $15/$30 tables, I was lucky that the worst was sitting close to me at almost every table and could really win some easy money there. At 06.00 I was only down -$230 and had to take a quick bathroom break again. I considered two options: 1) Be happy that I got back from -$2.300 till -$230 or play some more. I came back and the bad player was still sitting at the tables, I just couldn’t leave his money to someone else and in about 30minutes I won $600. The player was still sitting, but at 06:42 and up +$361 I was happy with the result. Nothing special, some might even be extremely basic (and don’t apply in every situation). Some might even think how could you write down those things? Well, when playing 20 tables for such a long time, you sometimes make pretty basic error, at least I do. I saw myself making these mistakes and I think writing them down helps in improving my “error-rate”. It’s not like I make hundreds of mistakes while playing, but every mistake I can reduce saves me a bet and since I win 0,5BB/100 you can imagine what every single bet could do to my winrate. The last thing worth mentioning is the fact that I didn’t play 24 tables since last week. I played 20-21 tables most times during my session and this really feels good. Playing 24 tables is sometimes okay and some periods I play in overdrive just clicking every single second. Playing 20-21 tables plays okay all the time and sometimes gives the feeling that I have sort of a break while playing (when things get slow). This helps me during my session and I intend to keep doing it for the coming period (or year). I don’t even think it makes a huge difference in hands/hour as I play all my hands a little faster which improves my hands/hour per table. I wanted to type some more, but I’m already typing for two hours! I’ll just stick to what I typed now, another week in the books. A really positive start of the week on Wednesday, a dramatic Friday and a good weekend. If this isn’t as real as poker should be, I don’t know it anymore! Yeah I’m still down for the month, but not -$4.000 anymore! I’m confident, motivated and disciplined and that will get me to where I want to go! Wow! I completely forgot to report about the status of my SNE run. Only 3K till I’m Supernova. I was planning to get 100.000 VPP in January, so getting there tomorrow feels really good! 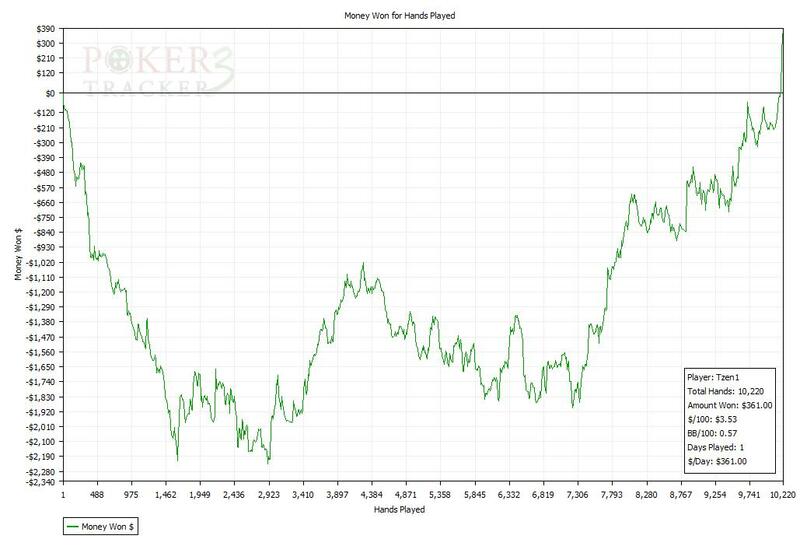 Good long weekly update again, sick swings but as long as the feeling on your game is ok it will come back in your results. Looks like SNE will be no problem with this pace 🙂 . I wish you a great year pokerwise (and not only…). I really enjoy your blog which is, by the way, maybe the best among hundrends of other poker blogs.